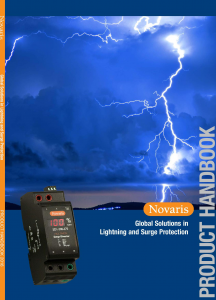 In this section you will find articles produced by staff at Novaris to provide you a deeper understanding of our products, about lightning protection and some tools to help you choose the right lightning protection for you situation. We pride ourselves on the quality of our products and want to ensure that they are installed properly, protecting you with the best lightning and surge protection possible. This Application Note describes the correct way to give full protection to your SCADA and process control systems. This Application Note describes in detail the correct way to protect Solar Systems from the effects of Lightning and Power Surges. This Application covers both stand alone and grid connect. This paper discusses the merits and applications of iSwitch technology in the surge protection of data and signalling lines. In particular a design solution is presented for the surge protection of 4- 20mA instrument loops that overcomes a fundamental shortcoming in existing traditional designs. This application note should be read in conjunction with Novaris Application Note 0015-D30V1_iSwitch_Application_Note that discusses iSwitch technology in more detail. With the advent of Remote Radio Units (RRU) at cellular basestations there is a need to supply power to these external units located at the top of the tower. Currently 48V DC power is supplied from the station battery. This means that the risk of damage to equipment within the building is greatly increased should lightning strike the tower as a proportion of the lightning current will enter the building via the 48V supply cables. This effect is even more potentially damaging than a strike a power line where the rectifiers provide some degree of isolation from the 48V supply. This paper considers this phenomenon, analyses the likely effects and presents a design that will prevent damage to equipment within the building. This paper also presents test results on some existing protection units and compares these with the Novaris design. This paper clearly shows that existing designs are deficient because the special characteristics of the 48V DC supply have not been considered. A final design that will effectively protect RRU sites is presented. Selecting appropriate surge protection devices is essential for implementing a robust and reliable surge protection solution. The surge protection system must be able to deal with large surge current while also providing a very low let through voltage during these events. This application note will be following the standards outlines in AS1768:2007 Australian Lightning Protection Standard which can be used to find more information including site risk assessments and structural protection application. The distributed nature of a CCTV network makes the system particularly susceptible to lightning and surge activity. During a surge event each remote camera and the DVR will rise to a different earth potential as each unit has a different impedance to ground. This can cause insulation breakdown and overcurrent problems for the equipment. To protect against these effects the protection device provides a low impedance path that reacts at a voltage lower than the insulation breakdown voltage of the equipment. This application note details the surge protection devices available for a most CCTV protocols and applications. 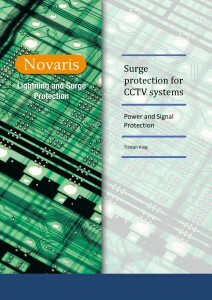 Novaris is well known for developing surge protection solutions for specific customer applications around the world. To achieve this we rely on a solid understanding of the environment and requirements for each project. This feeds from our consultative approach to surge protection. A recent example of this was a custom solution developed for a telecoms company in Sri Lanka. The remote mobile sites were exposed to a large amount of surge activity combined with grid instability. Railway signalling is a specialist field containing many types of electrical circuits, many of which are rated to the highest level of functional safety, SIL-4, “Fail Safe” or “Vital” in the traditional railway signalling parlance. Will the surge protection device (SPD) impact the safety rating of the circuit, even under failure conditions of the SPD? Will the SPD provide the desired level of protection to the circuit and its connected elements? What voltages and currents will the SPD be exposed too, including standing and fault voltages caused by other electrical systems such as traction and power supply systems? This paper presents a review of lightning protection principles and set out a methodology to be followed to provide a total solution to both the direct and indirect effects of a lightning strike. The information in this document may be used as a guide when planning lightning and surge protection for existing and future sites. Although providing basic guidelines and recommendations which will undoubtedly improve lightning immunity, it is recommended that expert assistance be sought should out the ordinary circumstances be present or a site configuration not covered by this document be encountered. It should be remembered that the provision of lightning protection both against direct strike and indirect effects will only improve lightning immunity. It is unlikely that 100% protection can ever be achieved although attention to proper design at an early stage before equipment installation can both reduce later costs and substantially improve protection in the longer term. In this article Phillip Tompson explains the differences of two primary products for protecting your installation, structure or equipment. Surge diverters and surge filters have many applications and both have their advantages for specific uses throughout a structure, installation; ensuring that your equipment and you are protected from direct and indirect lightning strikes and power quality surges. Surge filters provide far superior protection against lightning induced surges on mains power lines. Unlike surge diverters, their performance is not installation dependant. On top of these points, they have a longer lifespan and are more reliable than surge diverters. The full article can be read via the attached link below. The performance of a surge protection device (SPD) is governed by two main factors; the designed performance of the SPD and the installation practices used on site. The SPD performance can be gauged by the information provided by the supplier. The important parameters when selecting a surge protection device are described in this guide. The purpose of this paper is to estimate the reliability of Novaris coaxial lightning protectors. This analysis is a valuable tool to assist in planning the economics and repair of coaxial protectors. The reliability prediction for a Novaris lightning protector is calculated as the sum of a single connector pair (representing the input and output half connectors) and a protection component (required for the Gas-Discharge- Tube (GDT) based 3GHz and 6GHz series). An integral part of the design and application of the Novaris Signal Line protection units is taking into account their failure mode characteristics. Understanding the modes of failure can give an appreciation of the cause of such failures, identifying potential installation issues. The Novaris signal line protection units have been designed to minimise possible unsafe failure situations. For more than 20 years Novaris has utilised a range of metal enclosures for our power protection products. The current Novaris product range utilises a unique aluminium extrusion design to provide the best quality and safest products to our customers. There are of course some drawbacks to any design philosophy. This paper aims to discuss some of the advantages and disadvantages of the Novaris power surge protection design and our justifications for these design choices.